The Coast hx5 led flashlight is one of the well-built Pocket flashlights on the market. Coast is a well-known brand and has a wide range of flashlights. The coast hx5 is a uniquely designed LED flashlight suitable for outdoor and general use. It uses LED chip and is powered by three different types of batteries. It is a 145 lumen AA flashlight. If you need more bright flashlight then check this Coast HP7 410 lumen flashlight review. Also, it is lightweight and has two-way clip for easy storage of the flashlight. Read this Coast HX5 review to know more about this pocket flashlight. Since the discovery of LED bulbs, flashlight companies have been outdoing one another by coming up with new and better flashlights. Different brands create flashlights that meet different needs of users. But with all the competition, no flashlight has turned out to be perfect as you will find flaws in one flashlight or another, even if it is minor. The coast hx5 led flashlight can be relied on by the user to serve him/her for over a long period of time. This is because it is sturdily constructed from aluminum which is resistant to rust and corrosion. Also, aluminum is lightweight and hence the flashlight won’t weigh down the user during use. Furthermore, the flashlight is compactly designed which means that it fits well in the palms of the user. But if your hands are extremely big, this might be a bit challenging to hold and use. Batteries in flashlights play a very crucial role. The type of battery the flashlight uses determines how bright the flashlight becomes and how long it is able to provide constant light. Normally, rechargeable batteries run longer when compared to alkaline batteries. The coast hx5 flashlight is powered by NiMH, Li-ion, and alkaline battery. When you purchase this flashlight, you get one AA alkaline battery included. But you can as well use the other two types of batteries that we have just listed. With AA alkaline battery, the flashlight produces a maximum of 130 lumens, run time of 3 hours 45 minutes and covers 79 meters. NiMH battery produces a maximum of 125 lumens, run time of 1 hour 15 minutes, and covers 77 meters. Finally, Li-ion rechargeable battery produces a maximum of 345 lumens, run time of 45 minutes, and covers 130 meters. Just like most of the flashlight models on the market, the hx5 light uses LED bulb. LED technology has changed the way flashlights function and has made them better. It produces white light and it is very long lasting. If dropped accidentally, the bulb will not break or be destructed. In addition, the flashlight has a slide focus which enables the user to push or pull in order to change the flashlight from spot to flood light and vice-versa. The flashlight has no light modes but using different types of batteries provide you with brighter or dimmer light. Can you imagine having a large flashlight that you aren’t able to keep properly in your hands? This is disgusting as flashlights need to be portable and compact so that you can have it handy when you need it. The coast hx5 is a well designed and powerful light. Also, it has a two-way clip that allows the user to place it in any direction as they wish to. With dimensions of 4 by 1 by 1, and a weight of 2.5 ounces, keeping this flashlight in your pocket, backpack or attaching it to the belt is very easy and safe. The coast hx5 light is reliable to use, both outdoor and indoor. This is because of its durable construction. The hX5 flashlight is impact resistant and can as well defy bad weather. It has O-ring seals that prevent dust from entering the device and the body is made of aluminum. All of these make this to be a tactical flashlight and suitable for outdoor use and in tough conditions. Thus, you can use it for camping, hiking, jogging, or even running with the dog in the evening. Coast brand creates flashlights that meet the recommended standards. The coast hx5 led flashlight matches the ANSI/FL1 standards for a quality flashlight. This implies that the flashlight is ideal for use without any issues. A flashlight is a tool that can be needed anytime. This is true if you work in a dark environment or love going home late at night. That’s why getting a lightweight and portable flashlight should be on top of your priorities. The coast hx5 torch is very portable due to its size, weight and compact design. Using it is simple as it can be held easily in the hand due to its small size. Also, it is sleekly designed which will leave your friends or colleagues admiring it. Coast is a reliable brand and they have a wide range of products on offer. Since the company was formed, it has been coming up with durable and reliable flashlights. A good example of their excellent products is the hx5 flashlight. This flashlight is not only well constructed but as well offered at a very great price. Looking at the features it offers, it is right to say that the hx5 flashlight is worth every penny. 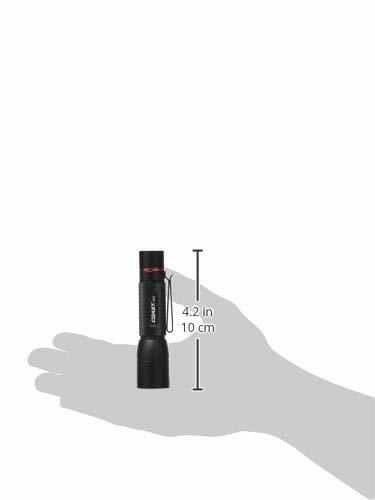 The coast hx5 flashlight is small and cannot fit in the hands of other people very well. So, as you think about acquiring this flashlight, it is important that you check its dimensions and determine whether it will be comfortable in your hands or not. Another shortcoming of this 130-lumen flashlight is that it doesn’t have light modes. Light modes help a person to have total control over the torch but this is not the case with this flashlight. Instead, the user can insert different types of batteries to get different brightness levels and run times. Li-ion offers the brightest light with 345 lumens, while AA alkaline batteries provide the highest run time of 3 hours and 45 minutes. So, after reading this Coast HX5 review, you can take right decision. The coast hx5 345-lumen flashlight is bright enough to light a whole room or your path. It enables the user to adjust the light from spot to flood light. It has the option of using NiMH, Li-ion or AA alkaline batteries. The flashlight reaches up to a distance of 426 ft when powered by Li-ion rechargeable battery. It is also impact and weather resistant. The HX5 flashlight meets ANSI/FL1 standards. If you purchase this flashlight, the manufacturer offers you a lifetime warranty against defects in materials and workmanship. These features make the coast hx5 led flashlight to be a great flashlight for outdoor activities and home use. I hope this Coast HX5 flashlight review article has given a clear idea about this light.